Named after the first President of the United States, Washington is a center of business, transportation and industry. Almost, 60% of its residents live in the Seattle metropolitan area. 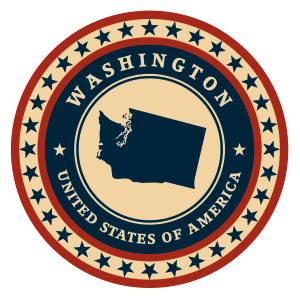 Washington's main industries include lumber, tourism, manufacturing, and technology. Two world renowned Washington companies are Microsoft and Costco. The state offers numerous advantages for companies willing to incorporate here. When incorporating in the USA, entrepreneurs should feel comfortable in the knowledge that their personal assets are protected. Corporations and limited liability companies separate the assets and liabilities of companies from the personal assets of the business owner. Washington requires that C corporations and LLC not have a name that is the same or could be confused with a business already in existence. To make sure your business name is eligible Inc. Plan can help you choose a unique C-Corp or LLC name. A unique corporate name enhances your company’s reputation and also helps protect the identity of your brand. The state of Washington imposes for any business entity a Business and Occupation Tax based on their gross receipts. The tax rate varies depending on the type of activity conducted. Corporations having a B&O tax liability below a certain level qualify for a small business tax credit. Washington does not have any residency requirements. Owners and directors do not need to live in state to legally operate a Washington company. Before your firm is legally eligible to operate make sure you possess all the required business licenses, permits, and tax registrations. Inc. Plan can help you stay in compliance with state law. C corps and LLCs must have at least one director/manager. There are no age restrictions for owning a business in Washington. Businesses must get a state tax identification number for all types of business entities. LLCs must contain the terms “Limited Liability Company” or the abbreviations “LLC” and “L.L.C.” C corporations must obtain approval from the Department of Financial Institutions if they want to use name designations like “Bank,” “Loan” or “Home Loan”. Entities that would like to use “Co-operative” in their name need special state approval. Use of the term “trust” is restricted. Entrepreneurs who would like to start an LLC must file a Certificate of Formation with the state. Washington LLCs are required to file an annual report on or before the company’s anniversary date. The Certificate of Formation must include the name and address of a registered agent who resides in Washington and who is available to manage legal and tax business documentation. For more help with filing an LLC or with finding registered agent services, kindly contact Inc. Plan (USA). The state of Washington does not charge corporate income tax on any business entity operating in the state. However companies are required to pay a Business and Occupation Tax (B&O Tax) based on their gross receipts. The tax rate varies depending on the type of activity conducted. Also, there are certain activities that are exempt from the tax. Entities having a B&O tax liability below a certain level qualify for a small business tax credit. Washington allows organization names that include the terms “Company,” “Corporation,” “Incorporated” or “Limited,” along with the abbreviations “Corp.,” “Inc.” “Ltd.,” or “Co.” Corporations must obtain an approval from the Department of Financial Institutions if they want to use name designations like “Bank”, “Loan” or “Home Loan”. Also, the term “Co-operative” needs special state approval. The term “trust” is restricted in its use. Entrepreneurs looking to start C corps in Washington must file Articles of Incorporation with the state. Additionally, C corps must submit an annual report before the anniversary month of incorporation. The Articles of Incorporation are required to list the company’s authorized shares along with their assigned par value. Entrepreneurs must also include the name of a registered agent with a physical address in Washington. Inc. Plan (USA) can help you with the initial filing process and provide qualified registered agent service. The state of Washington does not impose a tax on income for any business entity acting in the state. However, companies must pay a Business and Occupation Tax (B&O Tax) based on their gross receipts. The tax rate varies depending on the type of activity conducted. Also, there are certain activities that are exempt from the tax. Incorporations having a B&O tax liability below a certain level qualify for a small business tax credit.